What type of music do you need? Loretta’s Music includes several styles to choose from! Expert fiddling and Loretta's outstanding voice! Added harmonies and instruments as requested. Professional music for any occasion. Loretta is an expert Celtic fiddler and singer who can bring the excitement of the highlands and islands to you in a heartbeat! 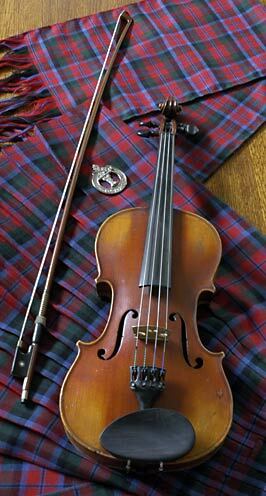 Hear ancient and modern tunes and songs from Scotland, plus those from Ireland and Cape Breton. Irish jigs, reels, and hornpipes are always a popular request. Scottish bagpipe marches, highland strathspeys, and reels will have toes tapping and fingers snapping. Traditional songs, romantic lyrics of Robert Burns, as well as those in the Gaelic language, will sweep you on a journey to the old country. Extremely popular and very exciting music! Anytime, anywhere! Authentic old-time country style fiddle playing evokes musical images of historic yesterday and the saga of the American cowboy along the Western trails. Includes the great music of early country singers and the Grand Old Opry, and unforgettable harmonies like the Sons of the Pioneers. Always a favorite for any audience! Yahoo! Historical, Patriotic, 18th & 19th century Nostalgia, Swingin' Variety! This is music that was commonly heard on the American frontier from the American Revolution through the Fur Trade era and the Civil War, up to and past the turn-of-the-century. Familiar songs and tunes which span the entire nineteenth century include unforgettable favorites like “The Girl I Left Behind Me” (1700s), "Old Dan Tucker" (1843), "Oh! Susanna" by Stephen Foster (1848), "Arkansas Traveler" (1863), "Golden Slippers" (1879). Loretta uses several instruments such as fiddle, autoharp, banjo, guitar, harmonica, and vocal songs to bring this period to life. National Armed Services songs and their history are perfect for any Patriotic celebration. Broadway Show and Swing era tunes bring smiles for everyone! Music for all holidays of the year! Lift your spirits with songs and tunes for holidays such as Christmas, Valentine’s Day, Patriotic and many other celebrations throughout the year. Sacred and secular. Well-known pieces and more highlight these special days. Familiar songs and tunes of several countries and cultures. - Italian favorites O Solo Mio, Return to Sorrento, and many others. - German songs and polkas especially great for Oktoberfest. - Klezmer high-energy tunes for celebrating in style. - And, of course, all things Celtic from Scotland and Ireland. Celebrate with music from around the world! These are well-known songs that you can sing along with representing the folk music revival and the acoustic rock era. We're gonna Rock Around the Clock tonight ! Holiday Celebration Strings are the perfect solution for your corporate or private Christmas holiday event. Plenty of great songs known by people far and wide. Many hymns and selections popularized by Tennessee Ernie Ford. A great choice to bring people together! Early music presented on violin and recorder. Great for any feast or celebration. These songs and tunes generally date from 1880s to the 1920s. The Cakewalk was a high strutting dance sensation of the late 1800s. Ragtime music is named for its “ragged” syncopation and includes two-steps, marches, slow drags, rags, and waltzes.